When you book with one of our Members, you can relax and travel with confidence. You can be safe in the knowledge that you’ve booked with a reputable company and, you can access our comprehensive range of support, protection and expertise should you need it. Remember that not all travel companies are ABTA Members so check before you book and read our top tips on how to avoid being caught out. All package holidays sold to you in the European Economic Area (EEA) by ABTA Members are financially protected so that if your travel company fails, you’ll be able to continue your holiday as planned or get your money back. When booking your holiday you should always check what type of protection is in place. For more information, see our guide to financial protection. Use of the ABTA logo is a benefit of ABTA membership and can only be used with ABTA’s express permission. ABTA has been informed that the companies below are currently showing the ABTA logo on their website or marketing material and emails. These companies are not ABTA Members and have no right to use the ABTA logo or to claim that they are a member of ABTA. The relevant authorities have been informed. If you have booked with one of these companies and have a complaint you should contact your local Trading Standards and Citizens Advice Bureau for further advice. You can check whether a company is an ABTA Member at the top of this page using the company name, address or ABTA number. Practical tips and advice for before, during and after your holiday. 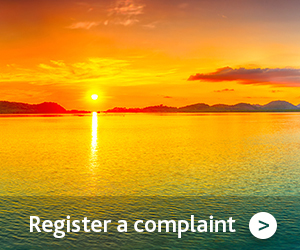 If you have a complaint or need advice, find out how we can help you.